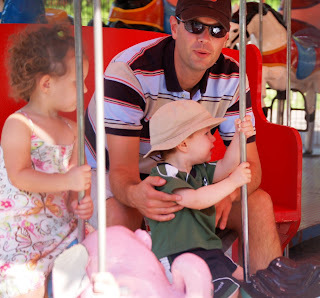 The Kinsmen Park rides will officially open for the season on May 7, 2011! 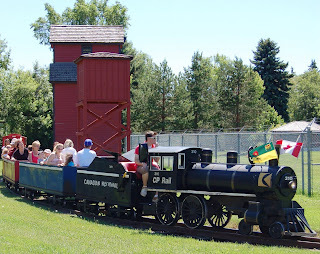 My personal favourite, the miniature train, is fun for all ages and is also wheelchair accessible. 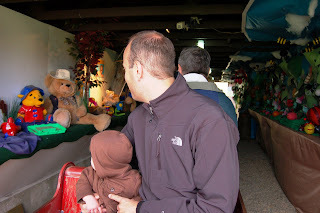 My son loves all the teddy bears as you pass through the tunnel. Be sure to point out the other side of the tunnel during the second pass through. My nephew is a big fan of the carousel. My son...not so much yet. On our maiden voyage last year, I ended up holding him all but the first 10 seconds of the ride. The animals do go up and down and round and round quite vigorously for a little one under the age of 2. There are benches on the carousel, as well as some small, stationary animals that itty-bitties can be held onto while you sit in the benches. 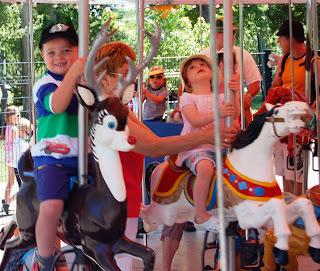 I do always get a kick out of watching the little jockeys thoughtfully deliberating over which hand-crafted animal they should choose before the beautiful antique carousel begins its rotation. Each ride is $1. One adult receives free admission per ride when accompanying a child with a paid admission. Saturday ~ 10 a.m. - 3 p.m. and 3:30 - 8 p.m.
Sunday and holidays ~ noon - 3 p.m. and 3:30 - 8 p.m.
Monday through Friday ~ 2:30 - 8 p.m.
Monday through Saturday ~ 10 a.m. - 3 p.m. and 3:30 - 8 p.m.